Each of the trials compared the novel agent included in that study to warfarin. 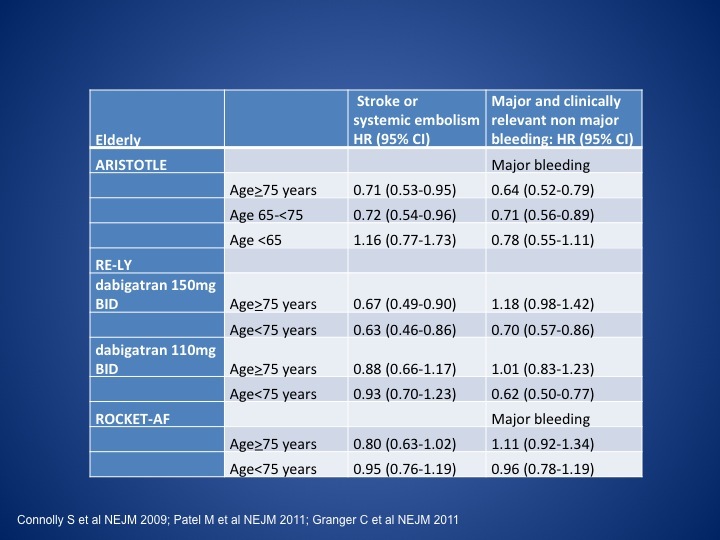 Here you can see that all the agents were better at preventing stroke or systemic embolism. The green box represents the hazard ratio and the green lines the 95% CI. 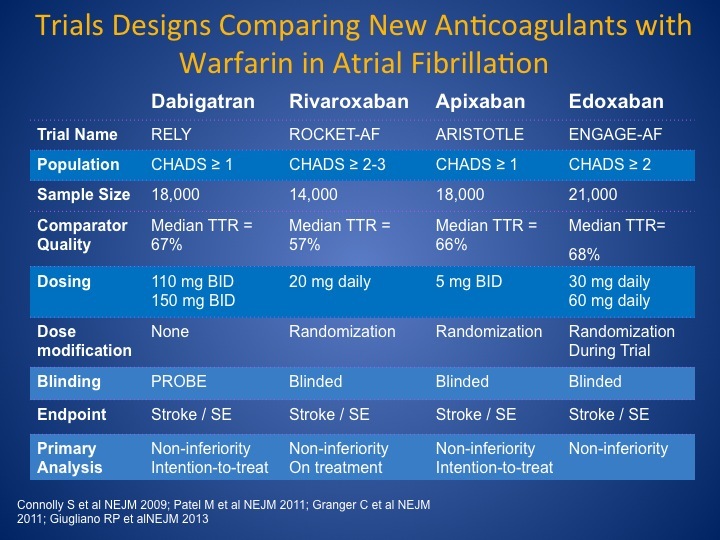 It is important to keep in mind that these figures show each agent compared to warfarin and therefore a comparison of one novel agent to another CANNOT be made. 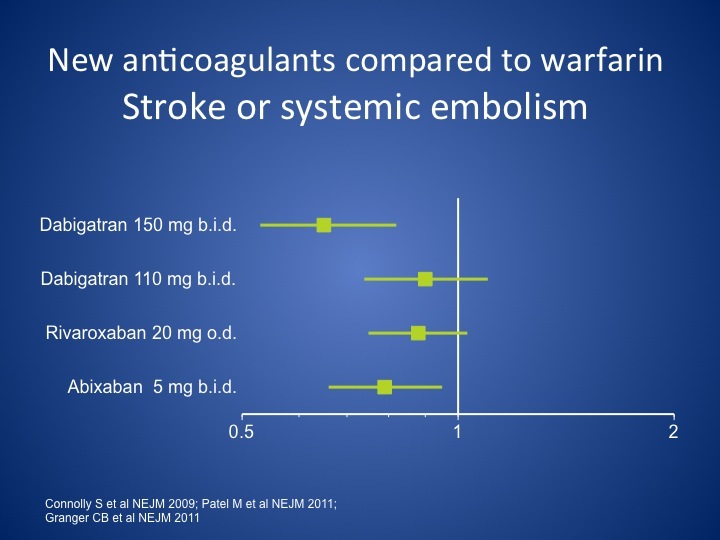 The figure below shows that these novel agents did not increase major bleeding when compared to warfarin. 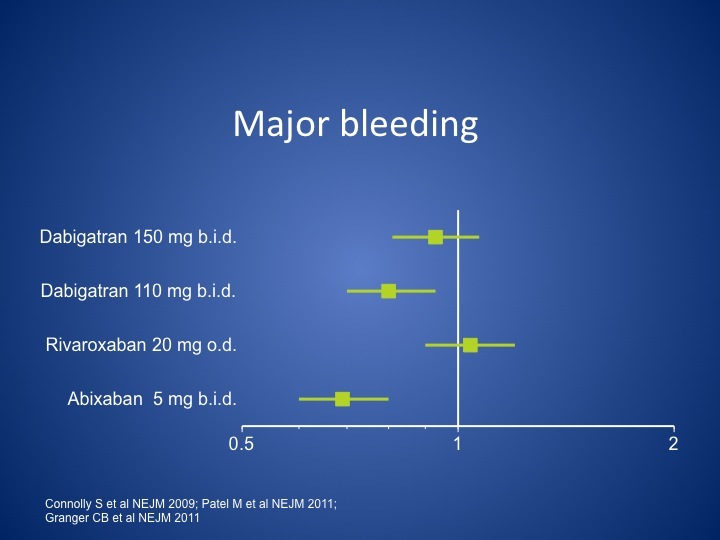 On this slide, you can see that apixaban had less bleeding than warfarin. 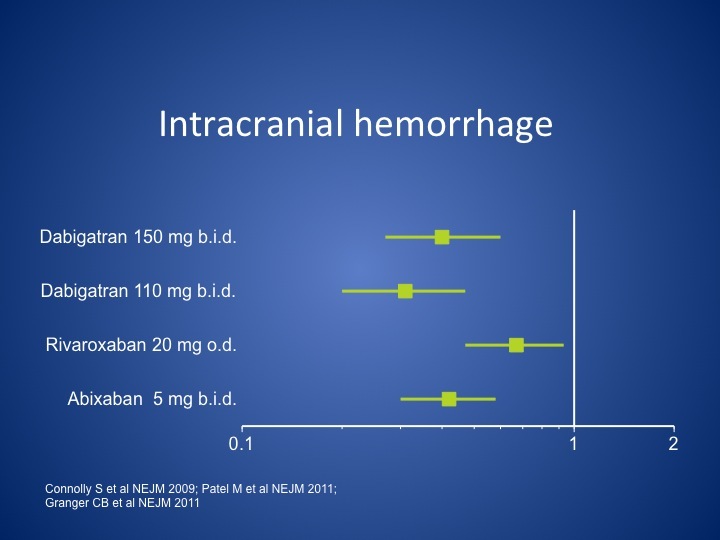 For intracranial hemorrhage, the agents all had less intracranial hemorrhage when compared to warfarin. 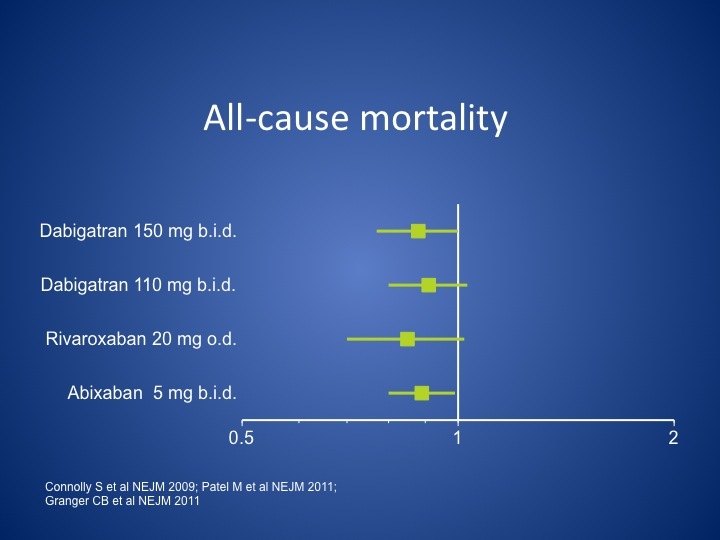 These are the hazard ratios for all-cause mortality again showing the benefit of the novel agents when compared to warfarin. Patients with recurrent gastrointestinal (GI) bleed: As seen in the figure below, dabigatran and rivaroxaban had higher rates of GI bleeding when compared to warfarin. 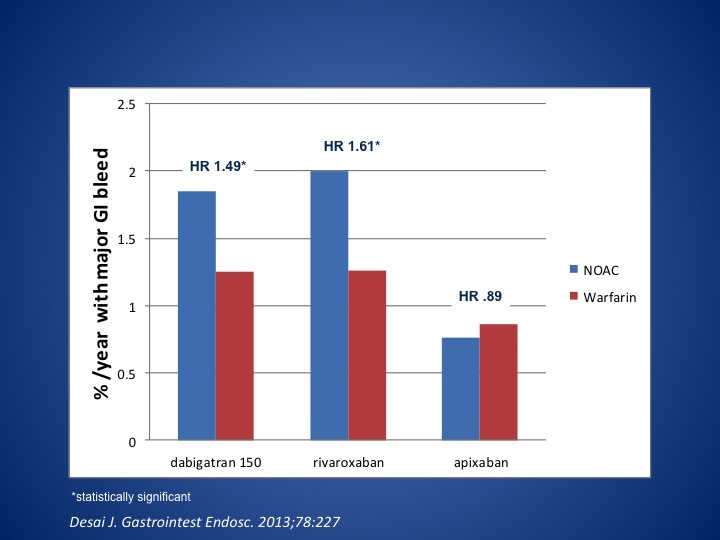 For apixaban, there was no difference in GI bleeding compared to Warfarin. So in patients who have difficulty with recurrent GI bleeding, it would be reasonable to consider apixaban until more data are available with the other agents. Elderly Patients: Given lower rates of intracranial hemorrhage in the clinical trials, these drugs may be attractive options for this population. Patients over the age of 75 years were well represented in the trials. Treatment benefits were consistent for all the drugs with the one exception being with 150mg of dabigatran. With this dose there was relatively more bleeding than with warfarin. For apixaban, the benefits of the drug was consistent in a population >80 years. Thus novel agents, with the exception of dabigatran at the 150mg dose, are a good option in patients over 75. Patients on aspirin and antiplatelet therapy (triple therapy): Use warfarin for anticoagulation. Review indication for aspirin and/or other antiplatelet agent. If possible avoid triple therapy. If both aspirin and P2Y12 inhibitor are both indicated, use triple therapy for the shortest time possible. Double check aspirin is low dose aspirin. Recommend use of proton pump inhibitor during time of triple therapy. Recommend using clopidogrel rather than prasugrel or ticagrelor. Cost of medication/Patient barriers: Always consider cost and other barriers that may interfere with therapy e.g. transportation to INR clinics for warfarin INR monitoring or cost of the newer anticoagulants.